This Philly native eats, breathes, sleeps and creates all things food and especially barbecue. A self taught chef who has been in the kitchen since age five, Chad found his calling in the world of barbecue, having won a series of competitions and events over the last 15 years. He is also a successful restaurateur, having opened a handful of BBQ, Comfort Food and Vietnamese restaurants in the Philadelphia area, including fan favorites The Lucky Well and Bánh Street. Most recently Chad was cast on Season 9 of Food Network Star and returned as a fan Favorite in Season 10. He was a finalist on Chopped Grill Masters Napa and is currently in development on several new TV concepts. 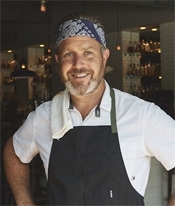 Chad is constantly on the hunt for new flavors and inspirations and loves to combine Asian cuisine with American BBQ. He is at his core an experimental chef who cooks by his experiences, his soul and his taste buds.